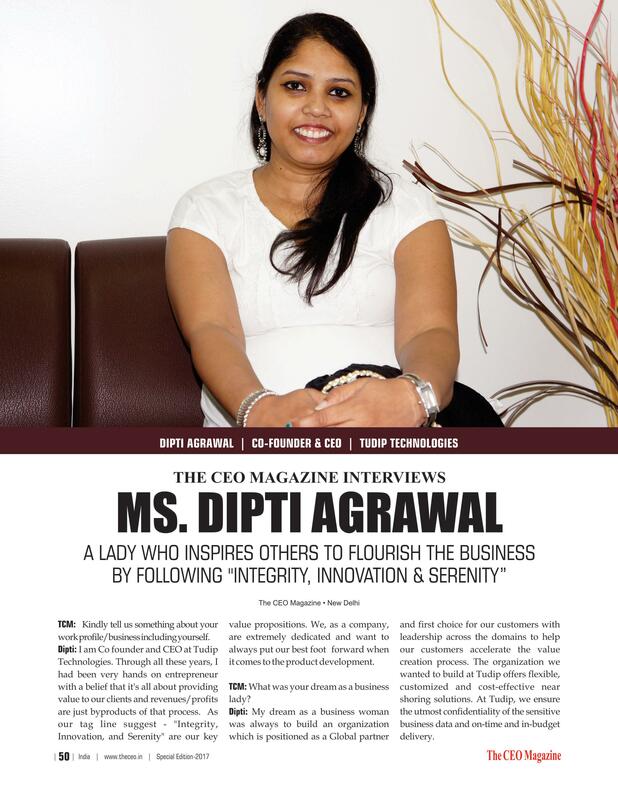 Dipti Agrawal, CEO, and Co-Founder of Tudip Technologies is one of the remarkable names betwixt the flourishing women entrepreneurs who believes that providing values to clients is of utmost importance where money just acts as a derivative in accomplishing that process. As a value addition, her feat lies in the fact that she has worked with diverse multinational billion dollars + club companies and has a remarkable domain expertise with right kind of exposure to international markets. TCM: Kindly tell us something about your work profile/business including yourself. 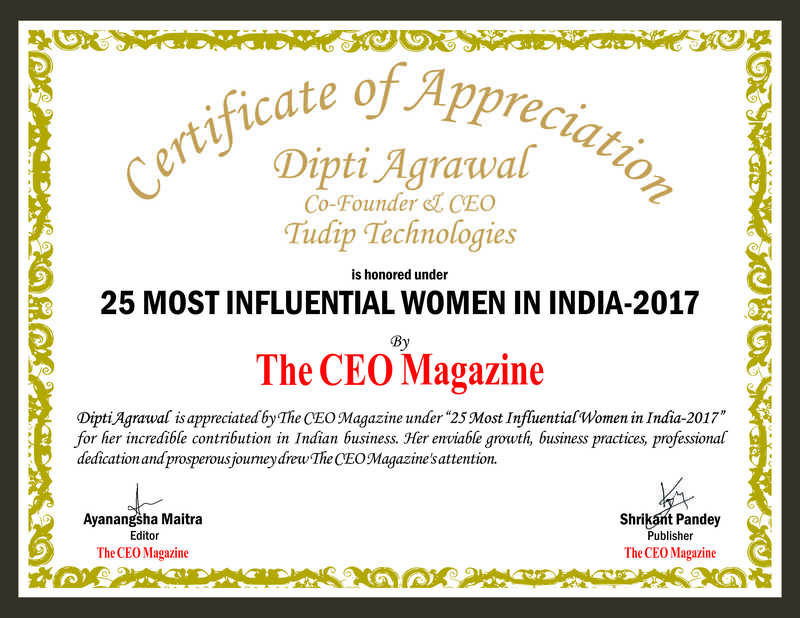 Dipti: I am Co-founder and CEO at Tudip Technologies. Through all these years, I had been a very hands-on entrepreneur with a belief that it’s all about providing value to our clients and tagline revenues/profits are just byproducts of that process. tagline suggests – “Integrity, Innovation, Serenity” are our key value propositions. We, as a company, are extremely dedicated and want to always put our best foot forward when it comes to the product development. Dipti: My dream as a business woman was always to build an organization which is positioned as Global partners and first choice for our customers with leadership across the domains to help our customers accelerate the value creation process. The organization we wanted to build at Tudip offers flexible, customized and cost-effective nearshoring solutions. At Tudip, we ensure the utmost confidentiality of the sensitive business data and on time and in-budget delivery. Dipti: Taking a 1 line idea from our client and building an end to end market-ready product with minimal guidance from them, is the most fulfilling part of this entire journey. Iterating it over the past 7 years, doing it on daily basis and cultivating a culture of delivery focused value addition had been the most satisfying accomplishment till date. Dipti: Yes and we always put an enormous premium on a failure! I think a failure is a failure only if we do not learn anything from it. We take every failure to our chin, go back to drawing board, dissect them in retrospection meetings and ensure that every failure taught us something and helped us in becoming a better company. Dipti: My parent and other co-founder had been the greatest support system I could have asked for. Over a period of time, we cultivated a set of people who could start acting as a bouncing board for ideas, to begin with, and eventually fill in more leadership roles in the organization. Dipti: Like it is said, higher the designations you hold, bigger the responsibility. You have to work hard each and every day without any excuses. The best part of being an entrepreneur is you never fall sick! Dipti: Quitting our well-paying jobs and having courage, that bordered upon foolishness at times, to start something of my own was one the best decisions that I have taken till date. TCM: What stimulated your ideas to start a new business venture or to bring significant changes in an existing business/at the workplace? Dipti: I always wanted to start something of my own and i was open for both product and services space. Our mission was always to build a software services company that can do core development work out of India and compete with the product development companies across the world. the time had been the best strategic decision that we have taken since the inception of the company. launch and continuous product growth. and widening our technological offering are the 2 core areas of stress in our future plans. Dipti: I believe these three people have been my inspiration. I would like to mention their names with a quote by them. Dipti: At Tudip, my coworkers hold the key to our success and they had been the driving factor behind this incredible journey of ours. This is precisely the reason why all our policies are centered towards the betterment of our employees without compromising our core services offerings to our clients. Dipti: Instead of looking at personal and professional priorities as 2 different stacks, entrepreneurship forces you to treat them as 1 consolidated stack. My personal life suffered a bit because of my professional life but the fact is entrepreneurs do not look for work-life balance but they are always looking for work-life choices. Dipti: I did not face any such challenge while leading an organization as I was always surrounded by people who looked skill and hard work as a deciding parameter instead of gender. To sum it up, leadership is not a matter of muscle but it is a matter of mind and multi-tasking all the time. I think we women are inherently better tuned to perform the leadership roles because we are good at these 2 key parameters. Sharing about the key values of Tudip Technologies, Dipti adds, “We believe in Integrity, Innovation and Serenity”. Clients of Tudip freely share their ideas and business strategies. Fostering an inspiring workplace and a culture of transparency and ownership in their collective conduct, they are accountable for their thoughts, actions, and communication. All employees are encouraged at Tudip to keep a constructive and optimistic mindset to work towards a solution. Their splendid approach to stand unique in crowd lies in their strategies that are geared to expand the business of their clients and harbour lifelong relationships with them.